The Crete Golf Club is a championship course, the only 18-hole golf course on the island of Crete and one of the most impressive courses of the Mediterranean, which holds a unique challenge and a pleasant experience for both golf players and visitors all year round. It is easily accessible from Heraklion Airport within 20 minutes (24 km) and from Villa Vicky within 5 minutes (3 Km). The course has been built to international PGA standards by architect Bob Hunt, a member of the English PGA. Each hole has been constructed separately and in harmony with the surrounding landscape, providing panoramic views of both the mountains of Crete and the Aegean Sea. 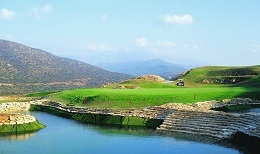 The standard of service at Crete Golf Club is exemplary and adds a great deal to what is already a special experience. The climate in the area is very mild all year round: The altitude ensures a light, cool breeze in high summer, making the game very pleasant, while in winter there is very little rainfall and the average temperature is between 15 – 20°C that rarely goes below 10°C on the coldest day. Knossos, also known as Labyrinth, or Knossos Palace, is the largest Bronze Age archaeological site on Crete and probably the ceremonial and political centre of the Minoan civilization and culture. The palace appears as a maze of workrooms, living spaces, and store rooms close to a central square. There is evidence that this location was inhabited during the neolithic times (6000 B.C.). On the ruins of the neolithic settlement was built the first Minoan palace (1900 B.C.) where the dynasty of Minos ruled. This was destroyed in 1700 B.C and a new palace built in its place. The palace covered an area of 22,000sq.m, it was multi- storeyed and had an intricate plan. Due to this fact the Palace is connected with thrilling legends, such as the myth of the Labyrinth with the Minotaur. 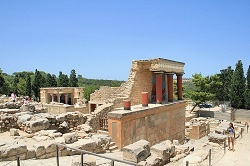 The archaeological site of Knossos is sited 5 km southeast of the city of Iraklion. It is a tourist destination today, as it is near the main city of Heraklion and has been substantially restored by archaeologist Arthur Evans. Phaistos is located 62 km south of Iraklion and, administratively, is part of the Municipality of Kamilari. 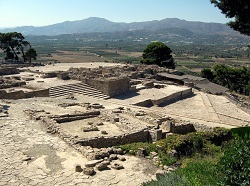 It was the second biggest city of the Minoan Crete and it is built on a hill, at an altitude of 100 m from sea level, in the fertile valley of Messara. According to mythology, this city’s King was Radamanthys, the brother of Minos and son of Zeus. The area had been inhabited since the Neolithic Period (3000 BC) and in its prime had two harbours, Matala and Knossos, with great commercial and financial activity. The valley is surrounded by mountain ranges and in the south extends the Libyan Sea. You can access Phaistos from Iraklion taking the road to Moires- Timbaki, an asphalt road of fairly good condition with a panoramic view to the Messara valley. The site can be accessed also from the south. Regular public transportation is available from Iraklion and Rethimnon. Ariving at Phaistos you will find a large parking area in a few distance from the palace. You have to walk for a while through a paved road until the entrance of the archaeological site where there is a restaurant- bar and shops with post-cards, guide-books, maps etc. for the visitors. The Heraklion Archaeological Museum is one the great museums of Greece and the best in the world for Minoan art, as it contains the most notable and complete collection of artifacts of the Minoan civilization of Crete. During the Venetian occupation period the Catholic Monastery of Saint Francisco used to be in the same place. Until it’s destruction in the earthquake of 1856, it had been one of the richest and most important monasteries in Crete and had contained great Byzantine frescos. The museum began in 1883 as a simple collection of antiquities. Although the museum was damaged during World War II, the collection survived intact and again became accessible to the public in 1952. Besides the Minoan collection, the museum covers other periods of Cretan history, with artifacts from the Neolithic to the Greco-Roman period. A unique exhibit of the Heraklion Archaeological Museum is the clay disc of Phaistos with hieroglyphics and ideograms inscribed on it. 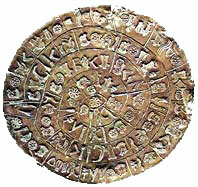 The inscriptions on the disc run in a spiral from the edge to the center of it. The script has not yet been deciphered. The island of Spinalonga , officially known as Kalydon , is located in the Gulf of Elounda in north-eastern Crete, in Lasithi prefecture, next to the town of Elounda. The official Greek name of the island today is Kalydon. 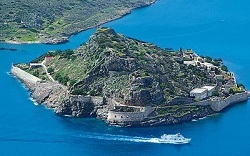 Originally, Spinalonga was not an island, it was part of the island of Crete. During Venetian occupation the island was carved out of the coast for defense purposes and a fort was built there. A popular name for the island since Venetian rule is Spinalonga. During Venetian rule, salt was harvested from salt pans around the island. The island has also been used as a leper colony. The disease LEPROCY was one of the most feared diseases of ancients times. It was believed that leprocy was the sign of impurity, and people kept a distance from anyone who had the disease. Spinalonga has appeared in novels, television series, and a short film. The entrance is free for the visitors who are attracted by its history and architecture. The village Koutouloufari is situated above Hersonissos port and is built near the foot of the Charakas Mountain. 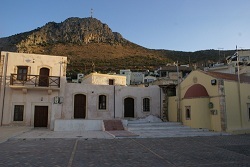 The characterization of the village as “traditional” concentrates the elements of another kind of tourist development, mainly based on high-lighting the exciting local colour of the island. In this amphitheatrically built village, tradition is vividly expressed, not only in the attitudes and characters of the inhabitants, but also reflected by the works of the art and in the shaping of places. The perfect combination of mountain and sea lend the visitor a sensation of serenity and a mood for exploration and entertainment. A sensation of past times, as well as the traditional colour has made that village into a cosmopolitan destination. In parallel to the romantic presence of the picturesque features of the landscape, there are restaurants where you can try traditional Cretan delicacies, with an amazing view an amazing view to the port. A tour within the traditional village is certainly worth making a stop. Relax for a cup of coffee of an ice cream in the colourful cafes. You can also buy souvenirs at teh shops of traditional products, which are spread within the narrow alleys of the village. The Village Piskopiano is situated between two other, equally beautiful villages Koutouloufari and Hersonissos. It expands amphitheatrically on the foot of the Charakas Mountain. Its name is related to the establishment of the old diocese of Hersonissos. It is a village, which will astound you with simplicity of its beauty and with its extraordinary charm and character. The old buildings in the villas will certainly amaze you. Exploring them, the visitor can obtain a lot of knowledge and get a clear picture about the architecture of that period, as well as of the culture and lifestyle of the older simple inhabitants of the village. Piskopiano is the meeting-point of the present and the past, as tradition is harmoniously linked to modern times and needs. If you visit that place, feelings of freedom and exhilaration will awake within you. The warm embracement of the openhearted inhabitants will certianly transmin to you beautiful feelings of hospitality and love. In Piskopiano, you have the opportnity to relish tour lunch or dinner in restaurants, buy your presents in souvenir shops and enjoy a selection of coffees in the cafes of the village. 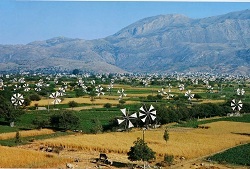 The Lasνthi Plateau, located in the Prefecture of Lasithi in Eastern Crete, is one of the highpoints of Crete, both in altitude and atmosphere, for it is unique: a green carpet hemmed in on all sides by the Dνktean Mountains, snowcapped into April and irrigated in summer by windmills. The picturesque windmills work regularly to water the fertile plain which covers an area of approximately 25,000 sq. km. As the excavations carried out on various sites have shown, this inaccessible area, encircled by high mountains ranges has been inhabited since Neolithic times. The plateau was farmed by the Minoans and later by the Dorians of Lyttos, but in 1293 it was such a nest of resistance that the Venetians forced everyone out, demolished the villages, set up guard around the passes and persecuted anyone who drew near. Only in 1543 were Greek refugees from the Turkish-occupied Peloponnese permitted to resettle the plateau. To reestablish the orchards, the Venetians built 10,000 white-sailed irrigation windmills. Although very few windmills are in use today, it still makes a splendid sight against the mountains. The uncanny cave where Zeus was born in Psychro, is the chief attraction. 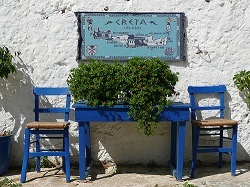 One of the 81 uninhabited islands of Crete is Chrissi Island. Chrissi lies 8 miles away from Ierapetra’s coasts, in the Libyan sea. Chrissi is almost flat with colorful volcanic rocks covered in gold sand, purple shells and sand dunes. From over there the visitor can have an impressive view of the Libanon cedar forest, probably the last existing in Europe. In the sea around the island the variety of the marine species is impressive. Around 54 different species of fossils were set on the volcanic rocks 350000 to 70000 ago, when the Chrissi was covered by water. From the middle of May till late October there are daily excursions to the island. 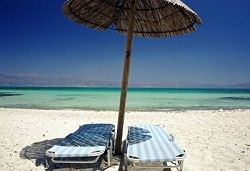 The departure is from Ierapetra at 10.30 a.m. and the return is around 16.00 p.m. The duration of the voyage is about one 50 min. (depending on the weather.) Within a day trip the visitor has enough time to walk around, bath in its turquoise waters and have a snack at the tavern.